Here she is! 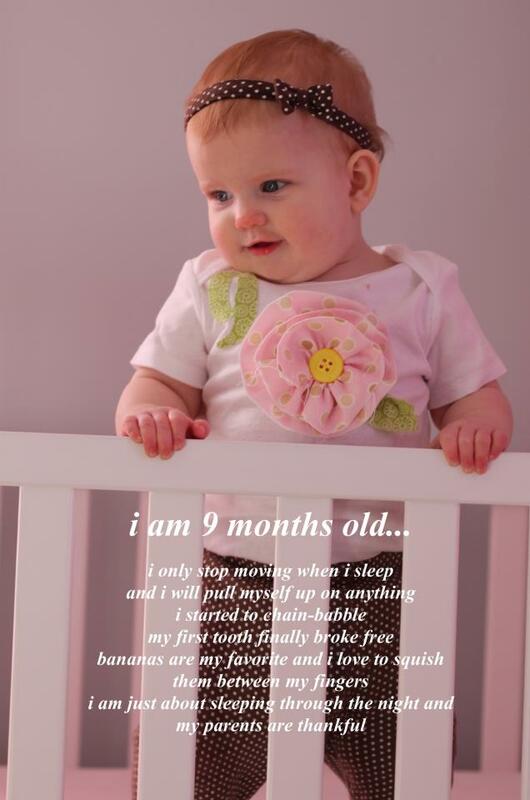 9 months old (actually 10 months now... I've had this post started for a while!) 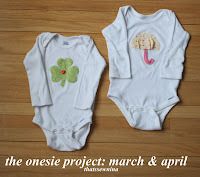 To continue with my April Showers bring May Flowers theme, I of course had to do a flower onesie for May. I decided on a simple rolled flower with a raw edge. Check it out! I cut a 1 1/2 inch strip of fabric about 15 inches long. 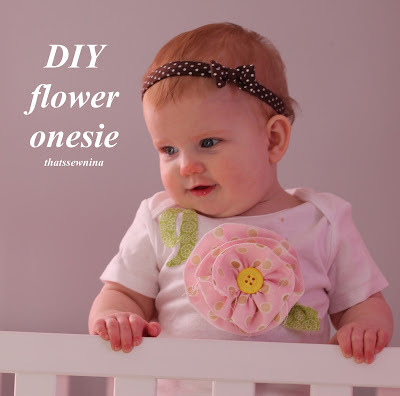 I like raw edges so if you prefer a neat edge, you could use ribbon or cut your fabric three inches wide and fold it in half lengthwise and sew the raw edge on the inside of your flower. Evenly spread your gathered fabric. Pin the outside circle of your flower down to the onesie. Sew along the inside edge and leave the long tail of remaining fabric off to the side. Continue wrapping the remaining fabric in a circle to form the flower. Pin in a few places to secure the flower in place. 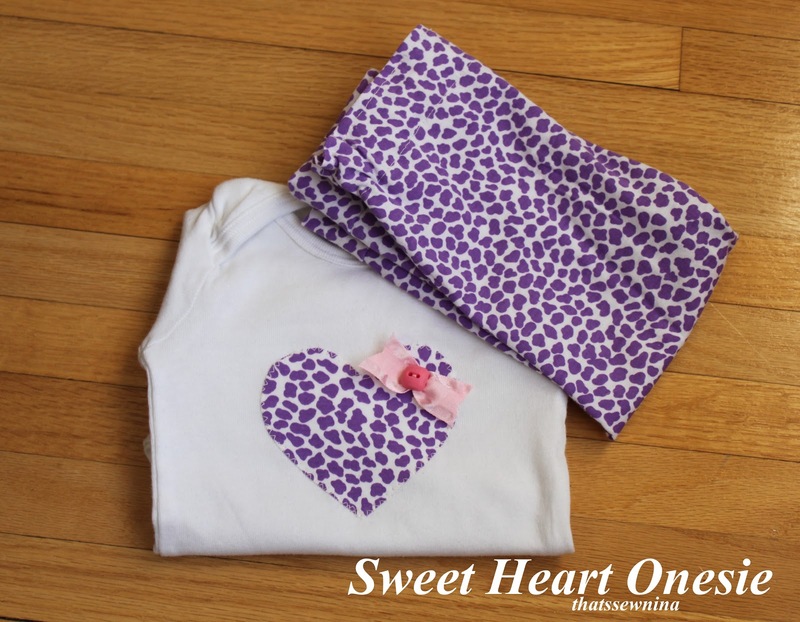 Handstitch the fabric to the onesie every few millimeters until it is securely fastened to the shirt. Cover the center seam with a coordinating button. Handstitch it in place. I wanted to add a leaf to the bottom of the flower so I just cut off the corner of a piece of green scrap fabric and gathered the bottom with a few handstitches. Stitch it in place underneath the flower. You're going to have to iron this to neaten it up after it's been washed. Boo. I hate ironing baby clothes. It just seems wrong. Like this? 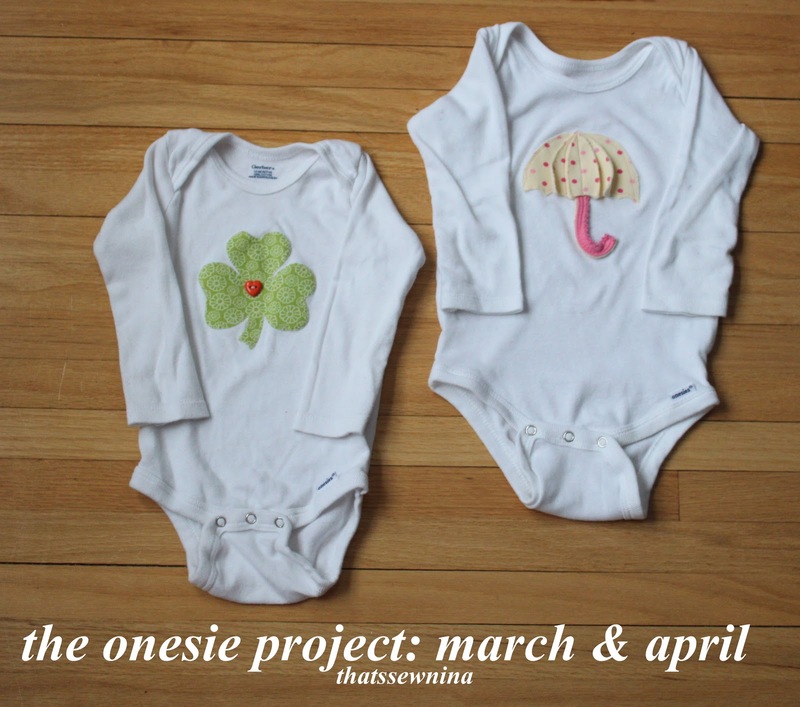 Check out my other Monthly Onesie Project posts!